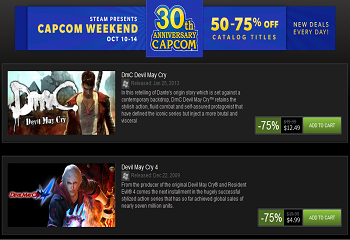 Capcom is offering heavy discounts on its PC titles through a Steam sale ending October 14th. Capcom is turning thirty and, in celebration of its many years on this Earth, the company has launched a Steam sale discounting a number of its bigger name PC titles. We're not talking minor discounts either, most of the games included in the sale are at least half price with many being sold as low as 75 percent off. The list of games falling under the umbrella of the sale is fairly substantial and includes Devil May Cry (the reboot), Devil May Cry 3, Devil May Cry 4, Dead Rising 2, Dead Rising 2: Off the Record, Bionic Commando: Rearmed, Bionic Commando, Lost Planet: Extreme Condition Colonies Edition, Lost Planet 2, Lost Planet 3, Resident Evil 5, Resident Evil 6, Resident Evil Revelations, Street Fighter IV Arcade Edition, Street Fighter X Tekken and Remember Me among others. Granted, not every title on the list is a sterling classic, but it's still an arguably decent selection of games. Gamers looking for a good package deal may also want to consider the Capcom Actions Hits Bundle which packages many of these same games together for a mere $59.99. Interested gamers will want to act fast as this sale is only running until October 14th.